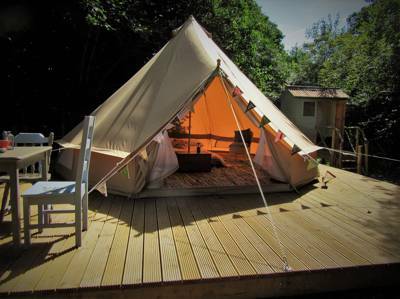 There may not be any electricity at Owl Valley Glamping but it’s certainly a good place to re-charge your batteries. And it’s precisely because of its off-grid set-up that this rings true. 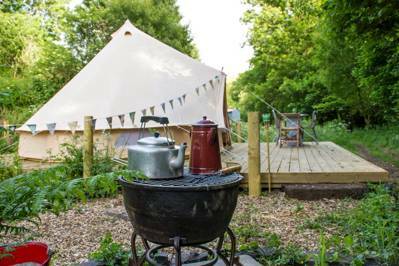 Blending luxury with back-to-nature authenticity, this wooded hideaway in the bottom of a North Devon valley is a real glamping gem. 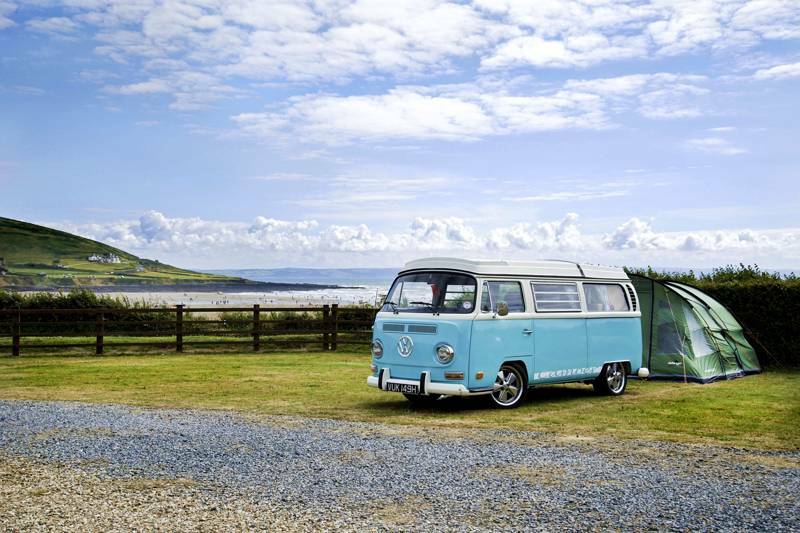 “We think of it as wild camping in style”, owners Ray and Pauline tell us. It’s hard to disagree. 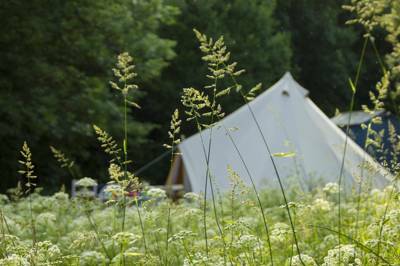 Comprised of just three bell tents and an enchanting woodland cabin, each set in quiet clearings among the trees, Owl Valley Glamping provides every comfort yet still has that essential camping essence. 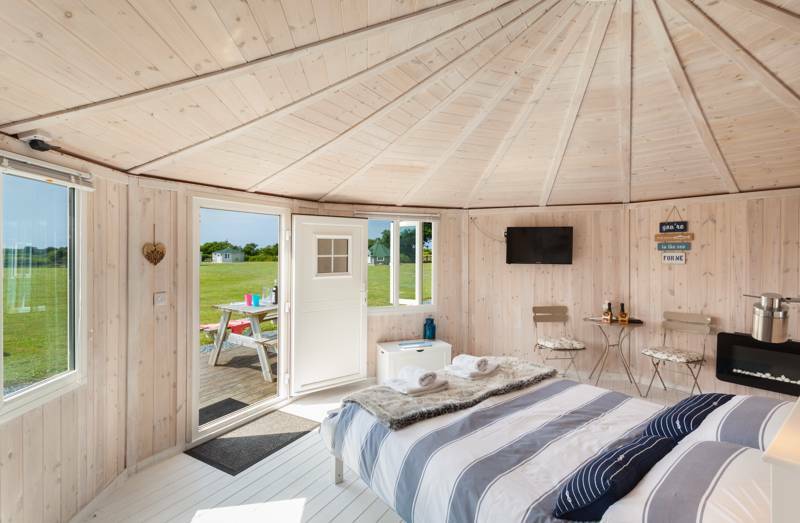 While the tents and cabin are furnished with double beds, wooden cabinets and each have their own private shower rooms, they’re also delightfully free of mod-cons. Internet evenings are traded in for nights around the campfire and day-time fun consists of real outdoor exploration. Dens can be built among the trees, there’s a pond where you can watch for dragonflies and a stream that bubbles through the site is like a magnet for children. Can they build a dam without getting soaking wet in the process? The answer is invariably no. The real beauty of the place, though, is its privacy. A relic from days gone by, the site is actually situated beside what was once an ancient horse and cart road, with Pauline and Ray’s thatched cottage the old, official toll house. Today it has been transformed into a glorious nature reserve where native wildflowers flourish. 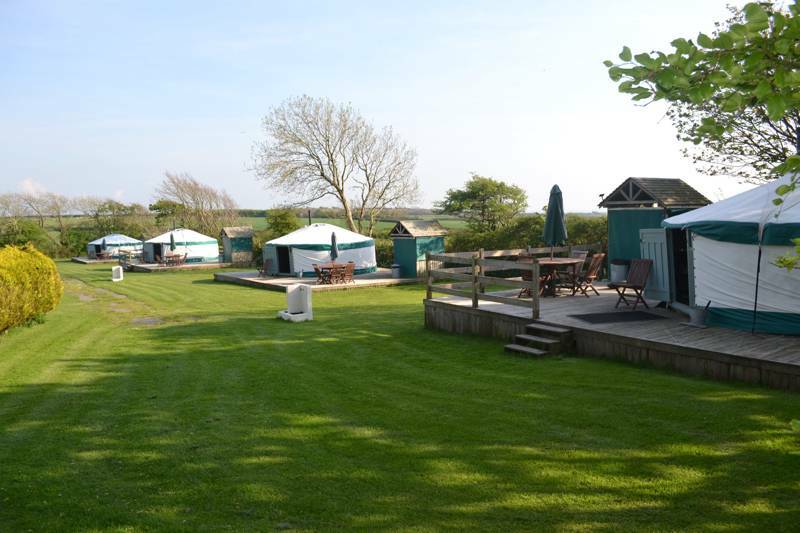 Shielded among the trees glampers feel a million miles from anywhere, when in reality the campsite is based in one of the most popular tourist areas along the North Devon coast. Pauline and Ray have even put together a little folder with information about local attractions, though for most the nearby beaches are the main headline. 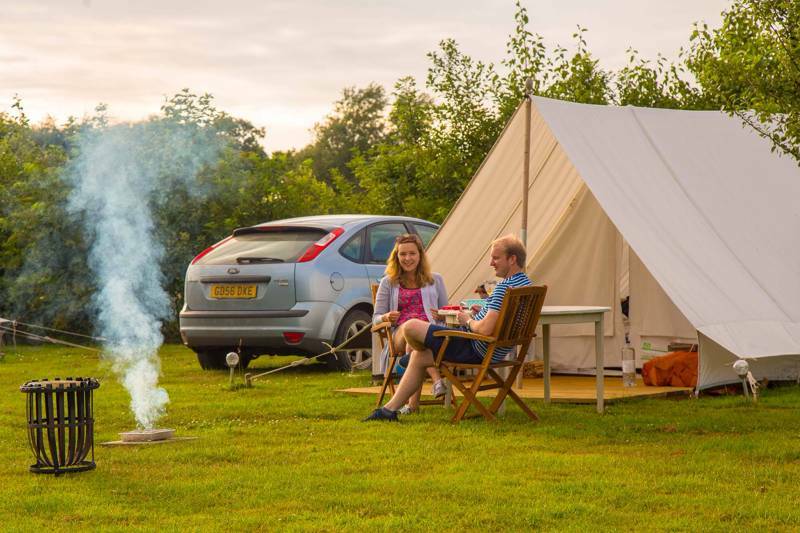 It’s equally easy, however, to spend all of your time simply hanging around the campsite. There are board games and wildlife books in the communal shack and, slightly higher up the wooded slope, a second hut with a wonderful BBQ terrace. It's the perfect place to sit and enjoy an evening drink. Gloriously off-grid, you can just sit back and take in the sounds of the woodland. 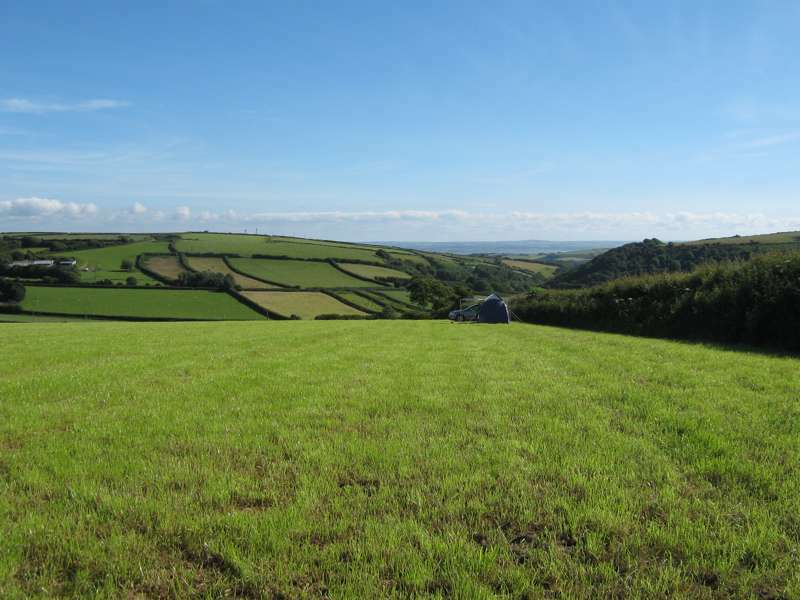 Owl Valley is located about 1 mile from Bideford North Devon. Full of bird song, flowers and places to explore it is a peaceful and secluded valley away from the pressures of everyday life. It even has its own stream and a pond full of wildlife. 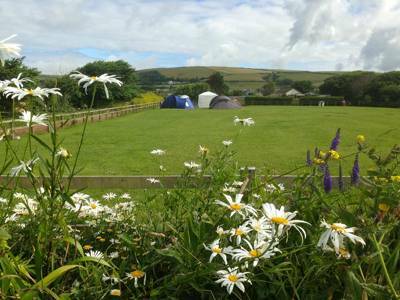 After moving to this tranquil, beautiful valley in 2015, owners Pauline and Ray decided they would like to share their valley with other like minded souls and 'Owl Valley glamping' was born. 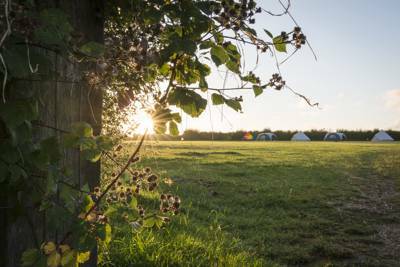 Our beautiful, if a little eclectic, Cabin Owlet and 3 x 5 metre Bell tents are named after some of our resident Owls: Barn, Tawny (30 metres apart) and the secluded Long eared. For latest availability and best prices for Owl Valley Glamping, please use the Date Search above. 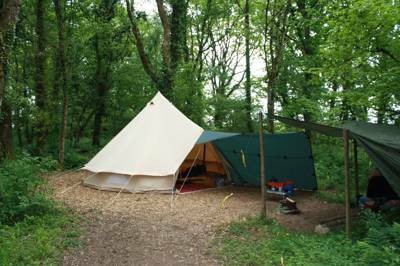 Luxury wood cabin and 3 bell tents, each with space for 2 adults and 2 children (extras can be accommodated for an additional cost). 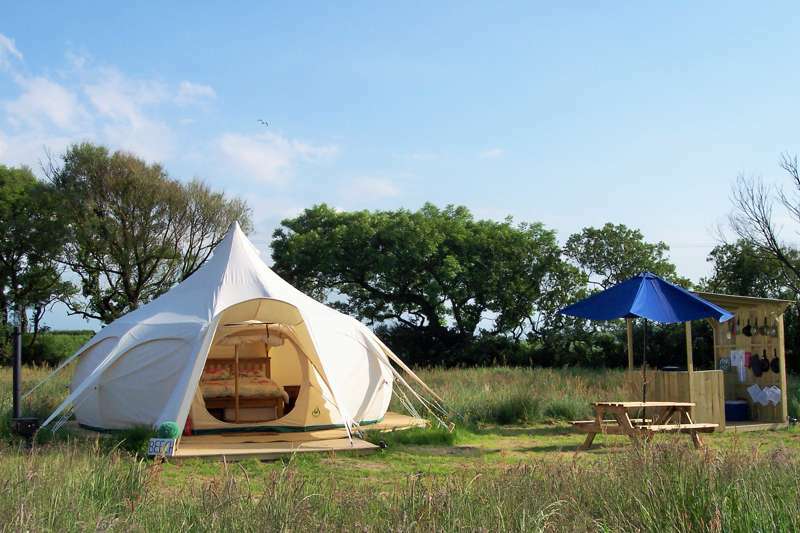 Bell tents have a double futon bed (bedding included) and single fold-out beds, a dining table and chairs, cooking equipment, cutlery and crockery, a BBQ, cool box and a campfire bowl (logs provided onsite). The off-grid Owlet Cabin (sleeps 5) has a double-bed (with bedding) and king-sized mezzanine (without), plus a chase lounge an extra child can sleep on. It has a wood-burner (and initial supply of logs), fairly lights, lanterns and an outside sun-deck with a BBQ, plus a covered kitchen with a 2-ring gas burner, sink with cold water cooking equipment (including coolbox) and crockery. Each unit has its own private compost toilet with sink, eco shower, eco liquid soap and shampoo and an outside fresh water tap. The 'parliament' recreation room has a porch with gas hobs, washing up facilities, table and chairs, pot bellied log burner, books, board games, dart board and a mini billiards table. There's also a kettle pizza BBQ in the 'beater's hut'. Further up in the woods you'll also find the campfire site and there's a small pond for dipping and a stream for dam building. One mile away, Bideford is the closest town, with independent shops and restaurants but it's the beaches beyond that most folks come here for. Famous Westward Ho!, Braunton Burrows, Croyde, Woolacombe and Bude are all popular sand and surf spots, while the pretty harbour town of Clovelly (01237 431781) is hugely popular for a non-beach related stroll. Take a boat out to Lundy Island (01271 863636) for the day or stay inland and cycle the famous Tarka Trail – miles upon miles of traffic-free cycle path passing close to the site and directly through Bideford. An honesty shop at the campsite sells milk, bread, beans and eggs – plus logs for the campfire and BBQ coals. There's also a great selection of nearby pubs. The Crealock Arms (01237 477065) is the closest – approximately one mile away (uphill going, downhill back! ), while The Coach & Horses (01237 451214) in Hands Cross is also worth a visit, as is the nearby Thatched Inn (01237 471321) in Abbotsham. 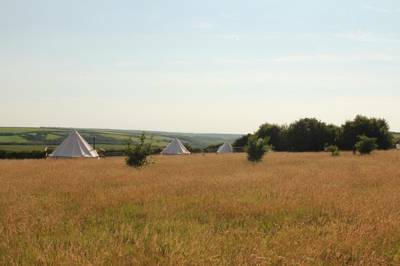 Bell tents: Low season from £77 per week-night, £86 per weekend-night. High Season from £85 per week-night, £95 per weekend-night (minimum 2-night stay). 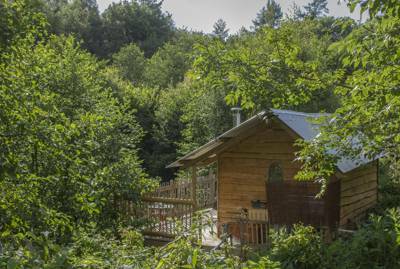 Owlet Cabin: £100 per week-night, £110 per weekend-night (minimum 2-night stay). Prices based on 2 adults and 2 children. Additional charge of £10 per extra adult and £5 per extra child per night. Nearest train station is Barnstaple (0845 700 0125). From here you can catch a bus into Bideford. 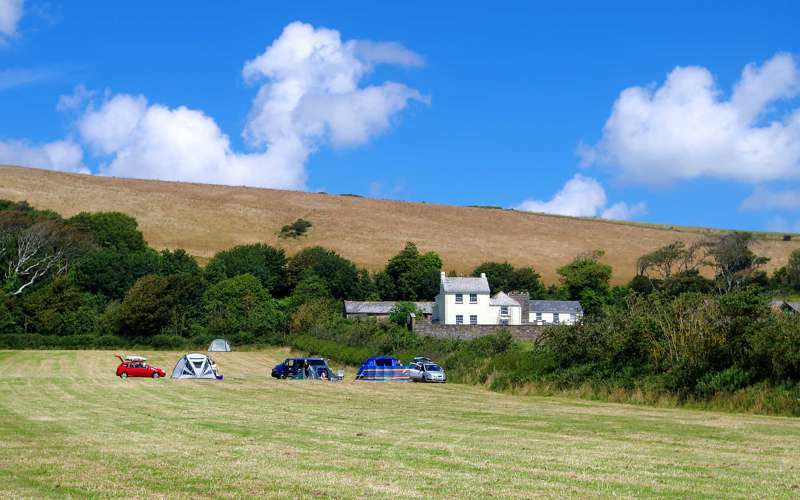 If you are feeling more adventurous you can hire a bicycle from Barnstaple station and cycle along the Tarka Trail into Bideford, it's then a short ride on to the campsite.